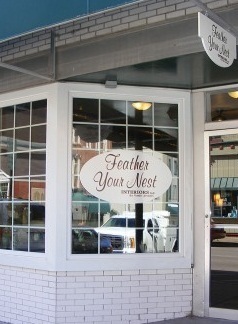 Feather Your Nest Interiors at 215 W. Second St. is expanding into the vacant storefront next door to the west. Both buildings are owned by Tom and Ann Meeker of Muscatine. Sharon and Dennis Froelich of Muscatine opened the furniture store in 2010. And they will be expanding the business in the next few months, according to their daughter, Alyshea Froelich, who is an interior design consultant at the businesses. The expansion will give the business four adjoining storefronts, Alyshea Froelich said today. And having a furniture store downtown — especially one that is expanding — is definitely a sign that good things are happening in Muscatine. I love this store. Wish I had really deep pockets and I would frequent them a lot more often.